Many of us struggled and cause headache after we save our files to our USB flash drive. Or in our drive of a computer then suddenly our files vanished or could not be open. This is because either the compatibility issue of a program we use is not compatible. Such as the file extensions or the source file. Other damage cause by a VIRUS(Vital Information Resource Under Seize). To avoid this such situation and one of the answer is to backup your files. Not a backup that the destination where to save the important is the same in our computer. It is also correct but you need to transfer the backup files to the other source storage. One the most common is by copying the files and data to the CD/DVD drive. But now this generation another source of storage that we can use to stored our files using the Internet. The same with the Google called drive and MSN(Microsoft Service Network)called Skydrive(onedrive). The purpose why it’s build through the Internet called cloud storage is to use as a backup storage of our files. The best advantage is very and easily accessible where you wanted to go in any country or within a place. You need only an Internet connection or a portable connection and a portable computer such as notebook. Now another cloud storage that they offered their service to us is the Dropbox.com. The dropbox is a file hosting service that offers cloud storage, files synchronization, and client software. Dropbox has a unique way in storing our files and data. It will allow users to create folders and it will synchronizing through the windows desktop through the windows explorer. So that once you login in you dropbox account it will uplink automatically in your dropbox inbox. And you can view now your files easily. In order to use this unique cloud storage just open up your browser such as the Google Chrome and type in your browser dropbox.com or click this link: dropbox.com. Now once it open just follow the steps below to create you account. After you click the signup button you need to select an account, either basic as free storage, Pro as 9.99 dollar per month, and business as 15 dollar per month. Then the screen will display that “Downloading dropbox”. As a basic instruction of this program you need to install the dropbox files in your computer before you can use and start upload and downloading your files. Then after downloading the files just double click the files icons in where it stored during download. And just follow the installation wizard in the screen. 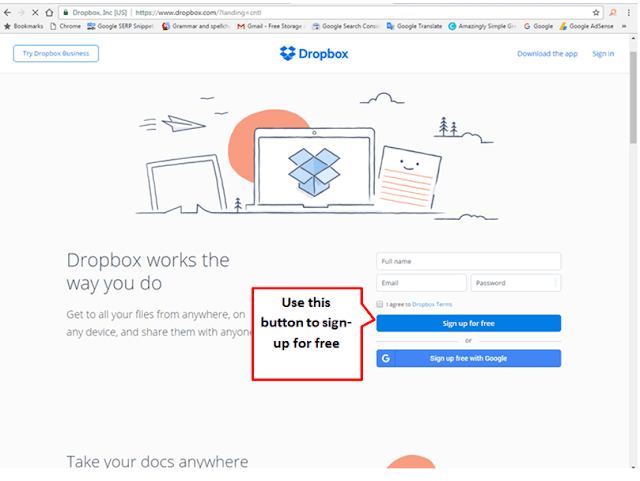 Just explore the interface of the Dropbox in your browser and just follow and learn the instruction written in account tab. Dropbox is better than USB flash drive, your files is very secure and you can access it anywhere and anytime. Free account is 15 GB compare to the USB affordable price is only 8GB.